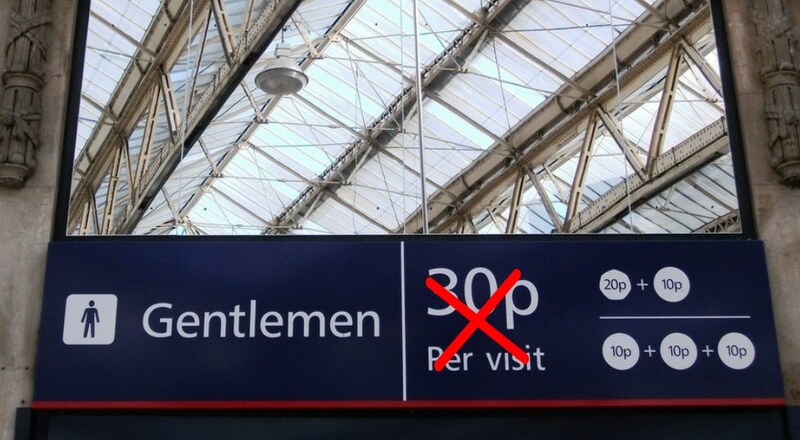 Early last year, Network Rail announced that they’ll be abolishing toilet charges at major London stations – and the day has finally come! Do you own a bladder? Do you sometimes have to pee? Do you find it wildly inconvenient that you have to pay for the “privilege” to relieve said bladder when you need to pee before you catch a train? Well, good news for every single human being on earth, because these toilet charges have finally peed off. If you don’t remember this iconic scene, you deserve to pay to pee*. Figures obtained by the BBC revealed that Network Rail collected £3.1m in toilet charges in 2017/18 – which is actually a drop from 4.8m in the previous year, but still huge. However, today (April 1 2019) is the day we finally get the freedom we’ve been waiting for. I, for one, will be peeing ’til my bladder’s content. If you don’t like spending money, here are 150 things to do in London that will cost you nothing at all. *Okay, literally nobody deserves to pay to pee. But you should watch Bridge to Terabithia, though.